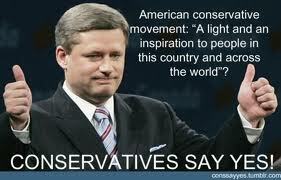 @PMHarper: "Canada greatest nation on earth" http://t.co/xdQUD1feVN via @TheTyee – @PMHarper: Why then surrender Canada to US #FATCA? Ladies and gentlemen, let me begin by giving you a big welcome to Canada. Let’s start up with a compliment. You’re here from the second greatest nation on earth. But seriously, your country, and particularly your conservative movement, is a light and an inspiration to people in this country and across the world. Now, having given you a compliment, let me also give you an insult. I was asked to speak about Canadian politics. It may not be true, but it’s legendary that if you’re like all Americans, you know almost nothing except for your own country. Which makes you probably knowledgeable about one more country than most Canadians. This entry was posted in FATCA, FATCASpeak and tagged FATCA, FATCA Canada, FATCA IGA Canada, Marion Wrobel, Minister Flaherty, Prime Minister Harper on March 6, 2014 by renounceuscitizenship. It's #FATCASpeak really, "Double Plus Good Thought"! http://t.co/Wnx7yTDuyR – What an Orwellian World!! It would have been quite impossible to render this into FATCASpeak while keeping to the sense of the original. The nearest one could come to doing so would be to swallow the whole passage up in the single word crimethink. A full translation could only be an ideological translation, whereby Jefferson’s words would be changed into a panegyric on absolute government. A good deal of the literature of the past was, indeed, already being transformed in this way. Considerations of prestige made it desirable to preserve the memory of certain historical figures, while at the same time bringing their achievements into line with the philosophy of Amtot. Various writers, such as Eric, Orwell, Just Me, Em, Badger, Calgary, Plato, Petros, Deckard, Joe Smith, SwissPinoy, Jefferson Tomas, Blaze, Outraged Canadian, Roger, Nobledreamer, Tim, Victoria, Bubblebustin, Recalcitrant, Markpinetree, Pacifica777, usxcanada, RenounceUScitizenship and some others were therefore in process of translation: when the task had been completed, their original writings, with all else that survived of the literature of the past, would be destroyed. #FATCA: The new tax law for #AmericansAbroad explained by a German Bank http://t.co/rJVwvgLD7d – It's Fear And Terror Caused By America! FATCA – “The New Tax Law For Americans Abroad” is an interesting video. The title: FATCA: “The New Law FOR U.S. Citizens Abroad” almost makes it seem like a benefit/gift for U.S. citizens abroad. This entry was posted in FATCA, FATCASpeak, U.S. tax issues, Uncategorized and tagged FATCA, FATCA English, FATCA Germany, FATCA IGA, FATCA Propoganda, FATCA Think, FATCASpeak on January 22, 2014 by renounceuscitizenship.